Dutch lotteries are known for their support to charities, and the Dutch Postcode Lottery is one of them. Every lottery ticket that is bought contributes to a better world. This is because of the fact that 50 percent of the revenue is donated to charities. So this lottery is not only good the participants, but for the world as well. This has to give you a good feeling! The Dutch Lottery is part of a so-called ‘holding’. It means that it’s part of an organization that consists lotteries in total. These are the Dutch Postcode Lottery, the BankGiro Lottery and the Friends Lottery. Together they form the ‘National Charity Lotteries Holding NV’. The non-profit lotteries have been coming together since 2014. Together they want to support hundreds of charities. Each of them focuses on different fields in the Netherlands. The Dutch Postcode Lottery supports organizations that focus on man and nature. Think about the support for refugees, for example. The BankGiro Lottery donates money to hundreds of charities in the cultural field, while the Friends Lottery on well-being and health. In almost three decades the Dutch Postcode Lottery has done a lot of good things. Nowadays it donates to 95 charities in total. Of course the organizations are very content with the help. The Dutch Postcode Lottery was established in 1989 by three businessmen who strived find a way to raise money for charity. By creating a lottery there was no need to organize actions all over again. Just the lottery would be enough to raise money in a structural way. The businessman wanted to support man and nature especially. They definitely succeeded, because over the years the Dutch Postcode Lottery has given an incredible amount of money to charities. In 1989 the National Postcode Lottery was a very small company. Only the founders and some employees worked there. A lot has changed since then. In 2017 it’s a large company with hundreds of employee. It’s actually the biggest lottery after the Dutch National Lottery. Thousands of Dutch people try their luck by purchasing one or more lottery tickets. The ticket uses your zip code and three numbers. This makes the numbers unique and personal. So in total you have four numbers, two letters and three other numbers. The numbers don’t necessarily have to be your own zip code. You can easily choose the zip code on the website of the lottery. It’s also possible to buy your tickets over there. A lot with the so-called ‘StraatprijsVerdubbelaar’ costs 12,75 euros. With this option the prize money will be doubled if you win. Without this double option a lottery ticket costs 11,50 euros. The draws of the Dutch Postcode Lottery take place every month and mid-year. At the end of the year it also organizes an extra draw. Perhaps you’ll start the new year as a millionaire. In total there are fourteen draws a year. The prize could fall on a ZIP code or a unique ticket. Each week some place in the Netherlands wins the ‘Postcode Street Price’. The lucky participants win 12,500 euros for every lottery ticket. If you play along with the StraatPrijsVerdubbelaar this could even be 25.000 euros! All participants can play automatically. This means that you don’t have to buy a lottery ticket every time to participate in the draw. Cash prizes are added automatically to your account. 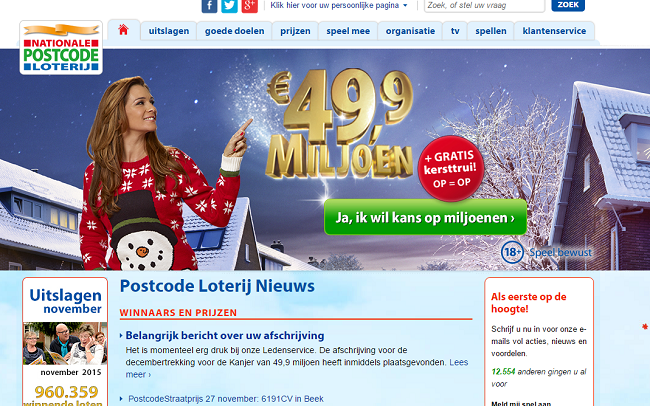 However, the Dutch Postcode Lottery does not only gives some very nice prices away. You could also win nice products like books and jewelry. Some people even win a car or a stay in a luxurious hotel. Perhaps you’ve already seen commercials for the so-called ‘Postcode Kanjer’. This is the grand prize of this lottery. People win millions of euros when the Postcode Kanjer happens to fall on their zip code. Participants can earn ‘Kanjer’ points if they play in the lottery. This is not very difficult, because every draw gives you ten ‘Kanjer’ points. So the longer you play, how more points you will have. This makes it also worthwhile to buy several tickets. You will then receive the ‘Kanjer’ points much faster. Every January the number of points goes back to zero. Last year you could win an incredible amount of money in the The Postcode Kanjer. The prize pool consisted 43.9 million euros! Of course more people won the lowest cash prize of 12.50 euros. Interesting about the Dutch Postcode Lottery is that it uses several Dutch celebrities as so-called ‘ambassadors’. For example, Humberto Tan is a well-known face of this lottery. Another familiar face is Gaston Starreveld. Every week he suprises people in the streets with the ‘Postcode Street Prize’. These people win 12.500 or even 25.000 euros per lottery ticket! The Dutch lottery even gets support internationally by former American president Bill Clinton and Archbishop Desmund Tutu. Your chance of winning in the Dutch Postcode Lottery depends on several factors. First of all, the number of participants. If many people play with your zip code, then it’s more likely that your zip code will win a prize. The winning chances also depends on the various kinds of prizes. As been said before, the Dutch Postcode Lottery does not only gives away money, but also products, small vacations and cars. Of course the chance of winning a smaller prize is much higher than a bigger one. On average you have a winning chance of 1:6 in the Dutch Postcode Lottery. Winners of the Dutch Postcode Lottery have made their dreams come true. Perhaps you’re having a big dream as well. What about a trip around the world, or a cruise on the Caribbean Sea? Everything is possible with money. Some people also save it for their house, business or the study for their children. Paying a debt or a portion of the mortgage also gives a sense of relief. By participating in this lottery you also contribute to a better world. That feels good! Even if you don’t win, your money is still went spent. Since the establishment of the lottery, there has been more than € 4.7 billion euros donated to various charities! Anno 2016, the Dutch Postcode Lottery supports 95 different organizations working in the field of man and nature. In 2015 it donated 328 million euros to charities. 50 percent of the revenue is for charities, thirty procent is spent on prizes and about 19 percent goes to recruitment and other costs incurred by the organization. All the prizes in the Dutch Postcode Lottery are divided by a ZIP code. This also has a negative side. People who do not participate feel that they have missed the boat. It could happen that the Postcode Kanjer falls on your ZIP Code. However, you don’t win a cent if you’re not a participant in the lottery. Other lotteries don’t play with this element, and The Postcode Lottery has been severely criticized for it. One of the advantages of the Dutch Postcode Lottery, if you’re a participant at least, is that your whole street wins. So you can celebrate with the whole neighbourhood. Besides that, there’s also a lot of support to hundreds of charities. This is actually the main goal of the Dutch Postcode Lottery: raising money for charities and foundations in the field of man and nature. It’s very proud to be the largest charity lottery of the Netherlands.